Excerpted from the Final Environmental Impact Statement / Management Plan and Martin, Jay C. 1996. Preliminary Comparative and Theme Study of National Historic Landmark Potential for Thunder Bay, Michigan. Great Lakes Visual/Research, Inc. Lansing, MI. The transportation of mineral resources like limestone, coal, iron ore, and copper began in earnest on the lakes during the late 1840s and increased in the 1850s as canals and railroads connected coal fields, stone quarries, and copper and iron mines to adjacent shipping facilities. In the coal trade, Lake Erie ports provided critical transshipment points between the coal fields of Pennsylvania and eastern Ohio and users all along the lakes, but particularly the upper lakes. In the 1840s the trade in coal involved only a few thousand tons per year. The increase in shipment of this product occurred with the shift from wood- to coal-burning factories, steamboats, and locomotives, and as coal became critical for generating electrical power. By 1896 almost nine million tons of coal were shipped annually from Lake Erie ports alone. The iron ore trade worked as a nearly perfect adjunct to the coal trade. Iron ore was first mined in close proximity to Lake Superior in the Upper Peninsula of Michigan during the 1830s, but Superior was difficult to reach because the rapids of the St. Marys River did not allow efficient transportation to lower lake ports. This changed in 1855 with the opening of the St. Marys Fall Ship Canal (more commonly known as the Soo Locks) and the consequent ease with which bulk cargoes could be shipped by water without the necessity of being unloaded, portaged around the rapids, and reloaded for the trip to the lower lakes. As cargoes started to flow southward from mines in upper Michigan and Minnesota to steel plants in Ontario, Ohio, Michigan, Illinois, Wisconsin, and Pennsylvania, the coal trade became a complimentary return cargo that increased the efficiency with which shipping firms were able to operate. In 1854 the entire production of the Lake Superior mines was just 3,000 tons. In 1897, total production had reached 12,469,637 tons. 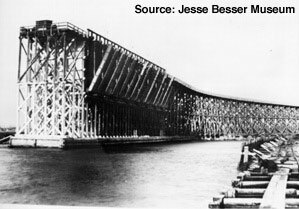 The coal trade directly impacted Alpena and Thunder Bay as this imported resource replaced the region's wood products as fuel, especially for industrial and residential applications. Thousands of tons of coal were transported past Alpena in the late nineteenth century. By the early twentieth century, a substantial amount of coal was being imported to Alpena for industrial and residential use. As a result of both the coal transit and import trade, a number of vessels were wrecked in the vicinity. Vessels lost with coal cargoes include the schooners ANNIE C. RAYNOR (1863) and LUCINDA VAN VALKENBURG (1887), the barkentine OGARITA (1905), and the propellers D.M. WILSON (1894), NEW ORLEANS (1906), MONOHANSETT (1907), ISAAC M. SCOTT (1913), and HELEN C. (1922). Copper was an additional, though not nearly as common, commodity in the bulk products trade. High grade native copper deposits in the Upper Peninsula and on Isle Royale in Lake Superior were mined for centuries by Native Americans for local use and trade. European explorers including Jacques Cartier and Pierre Francois Xavier de Charlevoix reported that the natives traded in copper, but miners made little attempt to obtain it in quantity until settlement began to catch up with exploration. In the 1840s attempts were made to mine copper near Ontonagan and Copper Harbor, but the miners found it extremely difficult to transport the fruits of their labors until the opening of the Soo Locks in 1855. By 1874, 36,000 tons of copper per year were shipped on the Great Lakes. The iron ore and copper trades, and the shipment of partially processed iron and steel, did not directly impact industry in Alpena and Thunder Bay as there were no local mills to refine these raw materials. But because hundreds of vessels engaged in these trades passed Thunder Bay every year, it is not surprising that vessels like the propellers PEWABIC (1865) and PORTSMOUTH (1867) and the schooner EMPIRE STATE (18777) were lost in the vicinity with iron ore and copper cargoes. The stone trade developed around the need for building materials as the region's lumber resources began to decline. Limestone quarried from Kelley's Island and the Marblehead Peninsula in Northwest Ohio went into the construction of the locks at Sault Ste. Marie. Plaster beds along Sandusky Bay in Ohio and Thunder Bay in Michigan produced construction materials for public buildings and private dwellings. 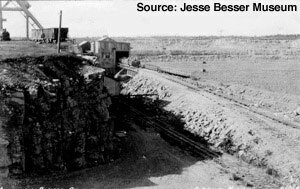 Quarries in the area of Rogers City and Alpena provided the raw materials for both public and private works all over the region. Rogers City is known as the site of the world's largest limestone quarry. During the late nineteenth and early twentieth century, larger and more modern vessels were pressed into service as Alpena and other ports began to specialize in the great quantities of processed stone and cement demanded by the building trades. The schooner E.B. PALMER was lost in the vicinity of Thunder Bay with a cargo of stone in 1892. The Huron Portland Cement Company, c. 1917. In 1901, the Huron Portland Cement Company began operation on the north shore of Thunder Bay. Limestone was used at the Michigan Alkaline Company plant in Alpena as early as 1903 to make soda ash for glass manufacturing. However, soda ash production created so much waste that the company ventured into cement production. The Michigan Alkaline Company quarry. 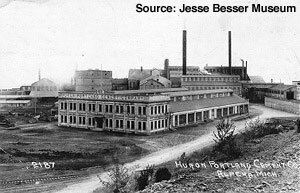 The Huron Portland Cement Company began cement production in 1907. The plant grew steadily, producting over 900,000 barrels of cement with six kilns in 1910, and became the largest cement producer in the world. Lafarge Corporation purchased the Huron Portland Cement Company in 1986 and continues to operate in Alpena. Loading dock of the Michigan Alkaline Company, c. 1918. The Great Lakes Stone and Lime Company of Rockport in northern Alpena County began operation in 1913 and provided rock for building and paving materials. The company is no longer in business.